It's getting to be that time of year. Yes, Christmas will be upon us before you know it. Last year, I shared with you a list of ways to earn a little extra cash over the holiday season. But, some people need more than just extra cash to help out during this time of year. 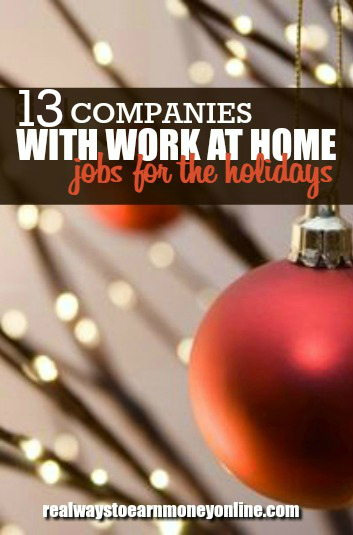 Fortunately, there are quite a few companies that have holiday work from home jobs that are seasonal. I know not everyone is a fan of temp work, but if you're in a bind and you're lucky enough to get hired on, this might help you through it. So, I did some research this morning and came up with this list of companies that are currently hiring for the 2018 holiday season. I was disappointed that just about all of these are limited to certain states, and I don't think any of them are open outside the US. But, you can always check my job leads page for more companies hiring — some of those are open outside the US. VIPDesk Connect is looking for seasonal brand ambassadors for Chanel to work through the holiday season. Training begins this month (October 2018). You will be responsible for assisting Chanel customers via phone, email, chat, SMS, and social media. This one is also limited to certain states, and they are currently looking for people in AZ, CO, FL, GA, IL, IN, NC, NJ, NM, NV, OH, TN, TX, UT, VA, or WI. More details here. Neiman-Marcus is currently hiring seasonal work at home customer service associates living in or near Dallas or Irving, TX. You will be working 16-40 hours a week, and you'll get two days off per week. Go here for more details and to apply at Neiman-Marcus. Nordstrom is currently hiring work at home customer care specialists in Georgia. The schedule is full-time offering some benefits as well. Go here for more details and to apply at Nordstrom. Intuit is currently looking for seasonal advice community specialists for their TurboTax product. Must possess one of the following: Active EA Certification or CPA. According to the job description, you will be, “Supporting TurboTax customers by providing clear and concise written responses to tax and technical questions in an online community.” However, the description also states you may sometimes have to communicate with customers by phone, so this is not entirely a non-phone job. Go here for details and to apply at Intuit. Training begins this month for these holiday work from home jobs, so apply soon if interested. Work from home seasonal customer service agents, for the following locations (in or near): North Carolina, Dallas, Cleveland, Cincinnati, Ohio, Phoenix, Las Vegas, Georgia, Reno, Tulsa, Oklahoma City, St. George, Utah. Full time, $12 per hour. You will work 30 to 50 hours per week. Go here to see the openings and apply at Williams-Sonoma. Vail Resorts is in need of work at home travel agents for the winter season. The position may last up to 8 months. You must live within 2 hours from either Broomfield OR Keystone, Colorado, or within 2 hours of Park City, Utah, depending on which job you apply for. Go here for details and to apply at Vail Resorts. Amazon is currently looking for work from home part-time seasonal shipping and delivery support associates. This job is open to people in the following states – Alabama, Arkansas, Idaho, Georgia, Kentucky, Louisiana, Mississippi, Nebraska, New Mexico, North Carolina, Oklahoma, South Dakota, South Carolina, Tennessee, West Virginia. The job may last up to nine months. Pay is $10 an hour during training, then increases to $12 hourly. Go here for more details and to apply at Amazon. Remote call center agents for member services support jobs open at Broadpath Healthcare. This job is open in many states nationwide. Salary is not listed. Full time, seasonal, October – March. Go here for more details and to apply at Broadpath Healthcare. Saddleback Leather is hiring seasonal customer service specialists. Must be a resident of Texas. Both full and part time positions are available. Pay starts at $11 an hour. The position will run from mid-October through January. There is a possibility of staying on with the company after the season ends. Go here for details and to apply at Saddleback Leather. Swim Outlet is currently hiring work at home customer service reps to work through November and December of this year. This job requires requires residence in California, Oregon, Ohio, Washington, or Connecticut and 2 weeks of full time training done virtually. Go here for more details and to apply at Swim Outlet. Hiring now for seasonal work from home customer service. Must live in Minnesota. Salary is not listed, but according to Glassdoor, it is $11 per hour. On their jobs page you have to scroll all the way to the bottom of the page to find the listing. Go here for details and to apply at Fun.com. Home Shopping Network (HSN) has openings for seasonal customer support agents in Florida and Tennessee. Salary isn't listed, but according to Indeed it pays $12.50 per hour. These are mostly seasonal positions, full time, with benefits. Go here for more details and to apply at Home Shopping Network. Now hiring for work at home temporary holiday customer service. Both full- and part-time positions are available. Pay is $15 hourly. You must live in California, Washington, Michigan, New York, Missouri, or Virginia to be considered for this job. Training begins in November. Go here for more details and to apply at Collage.com. Hayneedle is looking for work from home seasonal online retail specialists in Nebraska. The pays is $12.50 an hour and a background check is done. Part-time work. Go here for more details and to apply at Hayneedle. Be sure to get a membership to FlexJobs, the most trusted job board with flexible and remote work that is guaranteed to be scam-free. Get 30 percent off a membership with promo code AFFILPROMO. I've been a member myself for several years now.